Reddit noticed this today, as did EA Sports' official forums in December. 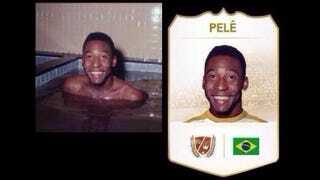 And now it's confirmed: EA Sports based its Football Ultimate Team card for Pelé, the greatest footballer in history, off a 44-year-old picture of him relaxing in the tub. The image in the comparison shot posted today to /r/gaming comes from FIFA.com itself, in a gallery entitled "Pelé off the pitch." It was shot in México in 1970 after Pelé's Brasil won the nation's third World Cup, which allowed it to retire the Jules Rimet Trophy, resulting in the creation of the modern World Cup trophy you see today. The caption, according to Getty Images: "Brazil's Pelé, one of the stars of the victorious Brazil team of the 1970 World Cup Finals in Mexico, relaxes in the bath." The owner is Popperfoto and its licensor is Getty. A spokesman for EA Canada, makers of the best-selling sports video game in the world, confirmed for Kotaku that they used Getty's image. "We are aware of the source image and we licensed the image from Getty," he said, chuckling. "And yes, it's not the usual type of image you would think we would use, but it created a great image for the Pelé Ultimate Team Legend item." Man. Now that is a hell of a way to be immortalized. Win the World Cup, jump in the tub, end up in a video game 44 years later.